Bob Hansen has taken to calling me "Strap Meister" because of the ways I have found to use ratchet straps around our auto restoration shop. In addition to securing an old car to a trailer, we have used different types of "tie-down" straps to squeeze front suspension parts together, to line up bolt holes and to squeeze the ends of an ant-sway bar together to fit the threaded ends into the holes. Ratchet straps can hold a car to a dolly and the dolly to a trailer. 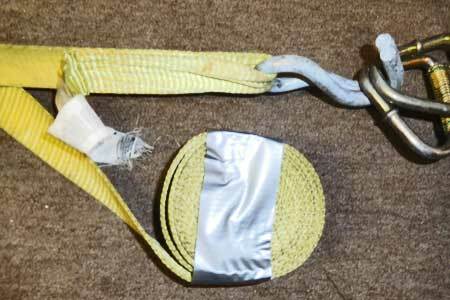 The heavier, wider yellow straps are the ones to use for the jobs described here. 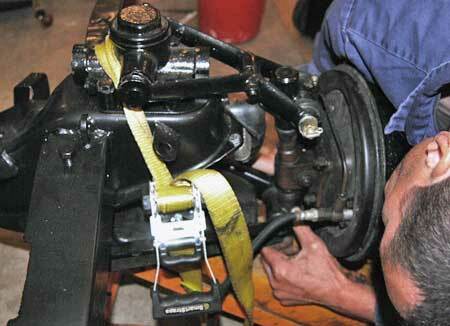 The first time we used straps in a novel way was when we were rebuilding the front suspension of an MGTD. 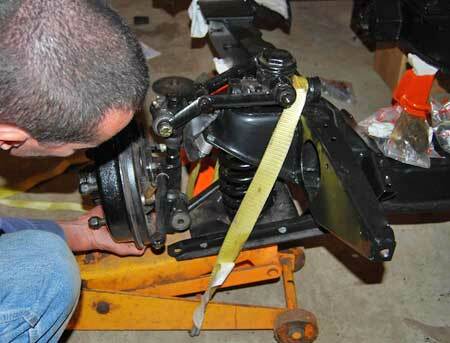 We carefully took the suspension apart using an internal spring compressor to remove the coil spring. 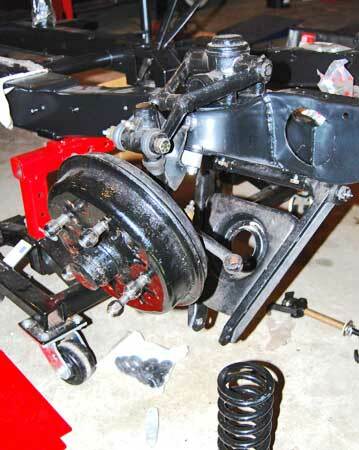 Then, we blasted all the parts, replaced the rubber bushings and ordered a pair of new coil springs. 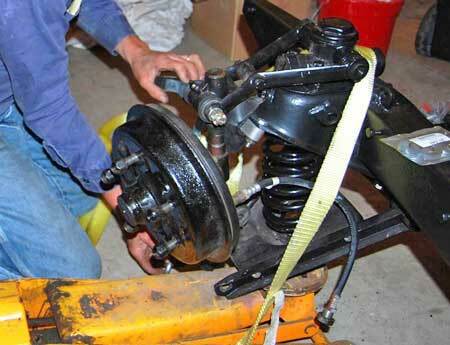 Of course, the final step of sandwiching the coil springs between the upper and lower control arms is the tricky part. You will place the top and bottom of the coil spring on the spring seats in the upper and lower A-Arms and squeeze them towards each other until the large bolts (called pins) can be slid through the holes in the outer ends of the A-Arms and the holes in the vertical link. Once all the pins are slid into place and nutted, they will hold the spring between the A-Arms. One book on MG T Series restoration outlined how to squeeze the A-Arms together by wrapping a chain around the A-Arms and under a floor jack. Then you pump the jack up, with a block of wood on the jacking pad. The jack is positioned so the block of wood rises up against the bottom of the lower control arm. The jack wants to raise the whole front end, but it can't because the chain is under the jack and keeps the front end from lifting. So, instead the tension forces the A-Arms closer together, until the upper and lower pins can be inserted. An MGTD suspension. The coil spring has to go in between the upper and lower A-Arms. As you can see, the pin bolt has already been inserted in the upper A-Arm. The trick is to squish the spring so the bottom pin can be inserted. Restorer Vince Sauberlich has the hook of the ratchet strap fastened to the bottom of the floor jack. He then wrapped the strap behind the upper control arm and hooked it to the other side of the floor jack. Positioning the strap in the best spots takes a little thought. Note how Vince has run it behind the upper inner fulcrum pin so it stays in one place. The jack pad is placed directly under the coil spring below the A-Arm. A block of wood can be set on the jack pad to protect the new paint on the A-Arm. With the jack raised up a bit, Vince attempts to slide the bottom pin into the outer end of the lower A-Arm. As the jack pad rises, it does not lift the frame very much because the frame is strapped to the jack. Only the lower A=Arm should move upwards. Just above the outer end of the lower A-Arm you can see the hole for the pin bolt. As you start jacking, make a quick check to ensure that everything is moving the way it should be. You need the holes in the lower A-Arm to line up with the holes in the lower link at the bottom of the spindle. Once the outer end of the lower A-Arm is properly positioned, the pin bolt can be slid through the hole and you can install the nut on the threaded end. Once this is done, you no longer need the ratchet straps. 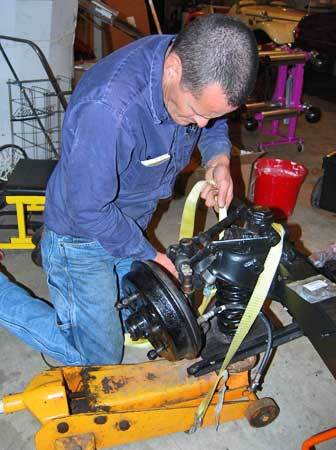 As it turned out, there was no length of chain lying around the shop the first time we tried the coil spring install. We then decided to try using a two-inch wide ratchet strap in place of a chain and this method worked just perfectly. Since we strapped that first MGTD suspension, we have used the same system to remove and install coil springs on a Daimler SP-250, several Triumphs and a big 1948 Chrysler. The system has worked perfectly every time. We've never had a safety issue either. There are different shaped A-Arm pans and spring seats for different cars, and different openings in A-Arms, but if you go slowly, logic will tell you the best spots to wrap the ratchet straps around. 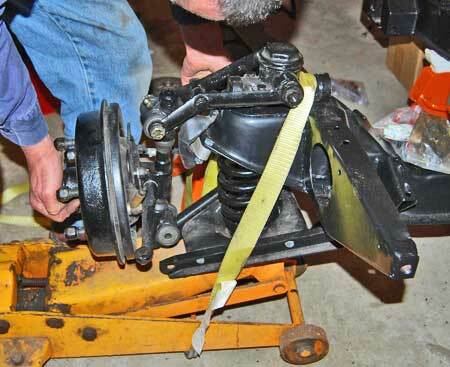 We used ratchet straps a different way when working on the rear suspension of a Triumph TR-7. This car has a four-link rear suspension with coil springs, a sway bar and shock absorbers. 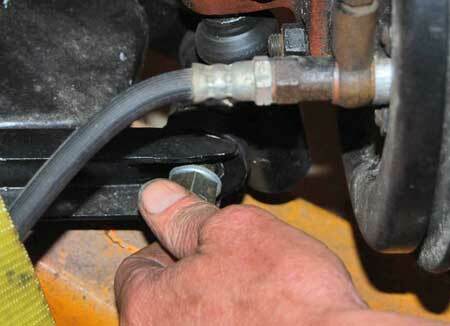 We removed the links and coil springs to install new bushings in the links. When we started putting things back together, we got the driver's side assembled and the passenger side parts just didn't want to line up enough to put the bolts through the holes. The car was on a 4-post lift, so we blocked the front wheels so the car would not roll forward. Then we got out a 25-ft long ratchet strap and a couple of axle straps (short straps with rings on both ends). We wrapped an axle strap around the beam at the front of the lift (the car was facing this beam) and we wrapped the other axle strap around the rear axle, being careful not to put it over brake lines and other plumbing. Then we hooked the long ratchet strap between the two axle straps and carefully pulled the passenger side rear suspension into a position where we could get the bolts through the holes and tighten them up. Unfortunately, we were so busy doing our rigging that we took no photos. We did take photos of another job we did with ratchet straps on the front suspension of the same TR7. After rebuilding the front end of the car with new bushings and cleaning everything up, we realized that removing the anti-sway bar had released tension on it and the ends of the bar moved outwards a bit. Although it was not a large amount of spread, it was enough to keep the threaded portion of the sway bar ends from going back into the holes they came out of. The anti-sway bar was also very strong and seemed impossible to pull in. After trying several other unsuccessful methods to pull the ends of the anti-sway bar closer together (such as jacking the suspension up higher), we realized that there was no easy answer to our problem. The ends of the sway bar were going to have to be pulled together or it wasn't going to go into the holes. We spiral wrapped an axle strap around each end of the anti-sway bar, leaving the threaded section of each end exposed. That was because it's the threaded sections that go into the holes. Next, we took a 15-ft. ratchet strap and shortened the length in half by pulling half of it through the slot in the ratchet mechanism. Then we hooked the ratchet strap to the two axle straps and cranked until the ends of the anti-sway bar moved closer together. We spiraled an axle strap around each end of the front anti-sway bar, but left the threaded section uncovered so it could slip though the attaching holes. A ratchet strap was then shortened up and hooked between the axle straps. Once the ratchet strap was hooked between the two axle straps, the ratchet mechanism was cranked to bring the ends of the anti-sway bar closer. This photo shows how much the ratchet strap was shortened up to fit between the two axle straps at the ends of the anti-sway bar. When using a strap to pull a car onto a trailer, only about a foot of webbing will wind onto the ratchet mechanism before the roll is too large to wind more. 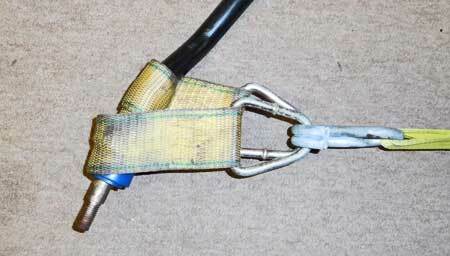 Short axle straps with rings on both ends are a good way to attached ratchet straps to objects. Clothespin helps keeps strap roll out of the way. If you do this, wear heavy work gloves. Pulling the ends of the bar together puts tremendous pressure on the ratchet strap. 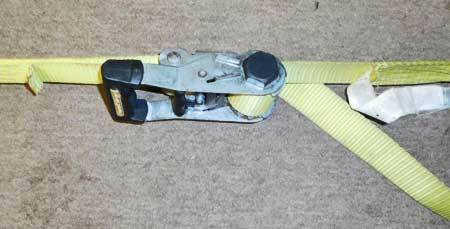 If the ratchet mechanism releases too quickly, the strap might "slap" your hand. Wearing the gloves will protect your hand in the unlikely case that the ratchet releases too quickly. Another job we have used ratchet straps for is to yank a car onto a trailer. This is not the best way to do this job, but if you don't have a winch and you have a couple of ratchet straps, it can get the job done in an inch-by-inch way. 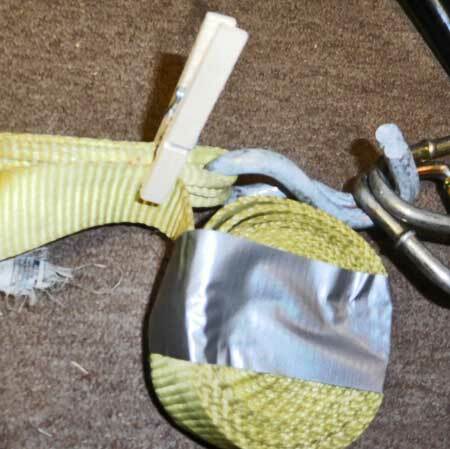 You can only crank up a foot or so of strap in a typical ratchet mechanism, so that's why you need to have a couple of straps to load a vehicle using this method. You need to have a way to hook one end of the straps to the trailer. E-track on the trailer floor works well. You can also hook the straps to the railing at the forward end of an open trailer. Attach the first strap between the car and trailer and move the car a foot. Then attach the second strap and move the car another foot. Use the first strap again for the third foot. 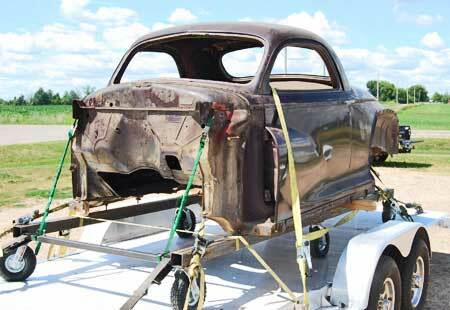 Slowly, but surely, you'll get the car up the ramp and onto the trailer. Then, you will be able to push it.